Elder L. Tom Perry (born August 5, 1922- 96 years ago yesterday; died 2015) was called as an Assistant to the Twelve in 1972, then as a member of the Quorum of Twelve Apostles in 1974. 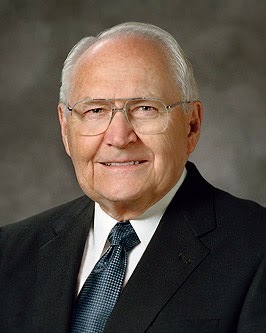 At the time of his passing at age 92, he was the oldest living general authority and the third in seniority among the leading quorum. "Develop a consistency in your lives of always trying to do the best with the talents you have. One of my favorite scriptures is found in the eighth chapter of Psalms. "'What is man, that thou art mindful of him? and the son of man, that thou visitest him? 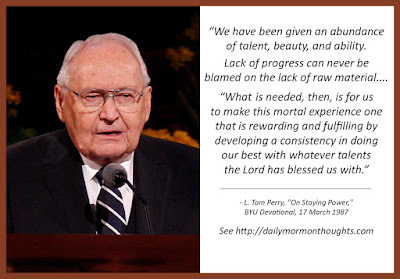 "What is needed, then, is for us to make this mortal experience one that is rewarding and fulfilling by developing a consistency in doing our best with whatever talents the Lord has blessed us with." You can just feel the joy and enthusiasm that characterized Elder Perry when he shares, "I like to think of myself as a junior angel" possessing potential to become an eternal being of power and glory. Elder Perry saw that potential in the consistency of developing our talents and using our gifts. We all have abundant "raw material" given to us; we just need to make the most of it!